Polishing is often used to enhance the appearance of an item, prevent contamination of instruments, remove oxidation, create a reflective surface, or prevent corrosion in pipes. In metallography and metallurgy, polishing is used to create a flat, defect-free surface for examination of a metal's microstructure under a microscope. Silicon-based polishing pads or a diamond solution can be used in the polishing process. Polishing stainless steel can also increase the sanitary benefits of stainless steel. 1 2 3 4 5 Oberg, p. 1439. ↑ Deck, Clara, The care and preservation of historical brass and bronze, retrieved 2009-01-06 . 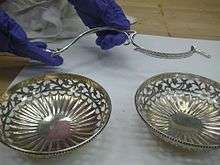 ↑ Use Of Kerosene In Polishing Metals, retrieved 2009-01-06 . 1 2 Oberg, p. 1440.